Dimensions 1.50 by 6 by 9.25 in. A definitive biography of the founder of the Church of Latter Day Saints that marks the two hundredth year of his birth chronicles the life of Joseph Smith, from his hardscrabble early life in rural New York, to the visions that inspired The Book of Mormon and the establishment of the Mormon Church, to his untimely death at the hands of a mob in 1844. Reprint. 60,000 first printing. Amazon.com description: Product Description: Founder of the largest indigenous Christian church in American history, Joseph Smith published the 584-page Book of Mormon when he was twenty-three and went on to organize a church, found cities, and attract thousands of followers before his violent death at age thirty-eight. Richard Bushman, an esteemed cultural historian and a practicing Mormon, moves beyond the popular stereotype of Smith as a colorful fraud to explore his personality, his relationships with others, and how he received revelations. 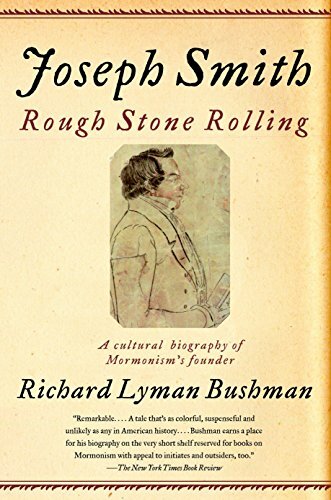 An arresting narrative of the birth of the Mormon Church, Joseph Smith: Rough Stone Rolling also brilliantly evaluates the prophetâs bold contributions to Christian theology and his cultural place in the modern world. About: Presents the life of the founder of the Church of Latter Day Saints, from his hardscrabble early life in rural New York, to the visions that inspired The Book of Mormon, and his untimely death at the hands of a mob in 1844. About: A definitive biography of the founder of the Church of Latter Day Saints that marks the two hundredth year of his birth chronicles the life of Joseph Smith, from his hardscrabble early life in rural New York, to the visions that inspired The Book of Mormon and the establishment of the Mormon Church, to his untimely death at the hands of a mob in 1844.